Our link with RBWH, Pathology Queensland and other local research bodies allows our academics and students to conduct relevant, focused and applied research. By bringing together leading health professionals, clinicians and scientists from around the globe, and supported by state-of-the-art facilities, CCR is having a real impact in their specialist areas. You'll be working with highly qualified researchers who are internationally recognised in their field. Enhance your research outcomes by using our state-of-the-art facilities. Combine your scientific research with clinical collaborations. Network and learn on an international level. By conducting your research with us, through a world class higher education institution such as the University of Queensland, you're giving yourself a great start in your new career. 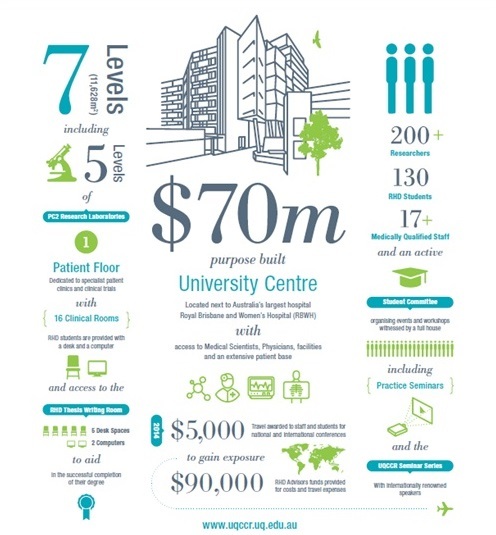 Our students have access to world-class facilities and research. You can read about their experiences here. Watch interesting research project videos and find out more about us.